We've been tracking the hectic, horrible off-season of Texas A&M's Johnny Manziel for months. But to get the impact of Johnny Goofball's worst decision, we have to go all the way back to January. It was then that Manziel allegedly did something illegal that might render him ineligible for the 2013 season. According to this ESPN report, Manziel flew to Florida for the Alabama-Notre Dame BCS National Championship Game and was approached at the airport and agreed to shortly thereafter sign hundreds of autographs on photos and memorabilia in exchange for a five-figure payout. The NCAA is conducting an investigation and - if Manziel did indeed sign-for-pay - could rule the reigning Heisman Trophy winner ineligible for the 2013 season because of a violation of Bylaw 12.5.2.1: Accepting money for promoting or advertising the commercial sale of a product or service. Getting kicked out of a Texas frat party is one thing. But violating an NCAA rule that could destroy the season before the first snap is serious stuff. According to the report the NCAA was alerted to a plethora of Manziel memorabilia hitting eBay in the wake of the title game, and multiple companies have deemed the signatures as authentic. 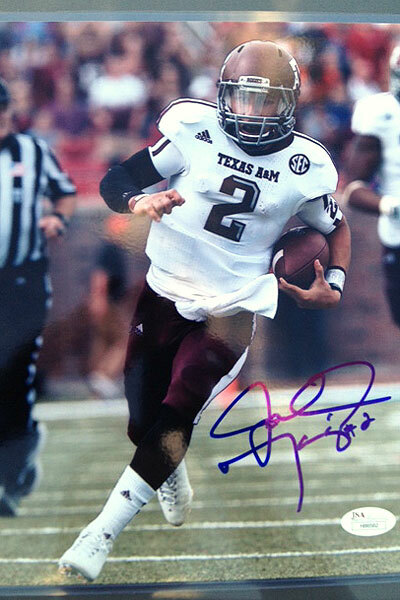 Manziel is expected to hit the field for the Aggies' first practice of 2013 this afternoon in College Station at 5:45. But not surprisingly, his scheduled media availability has been canceled. I go back to the recent interview with Manziel's father, Paul, who ominously said, "It could all come unraveled. And when it does, it's gonna be bad. Real bad." While Johnny Goofball hasn't been forthcoming to his school about his off-season choices, A&M is now faced with a dilemma: Do they play Manziel and jeopardize the season? Remember, if the Aggies are found to have used an ineligible player they would forfeit all games he played in. I think Manziel's undoing will be because of the people around him, and not his family. I'd be shocked if they could track the money directly to Manziel, and not to "Uncle Nate." Seems like his dad has given him everything he's asked for, not sure why JM would throw everything away by taking money illegally. That being said, let's look ahead. He will be available in next year's draft either from being declared ineligible by the NCAA or leaving early. Who drafts him and in what round? Vince Young didn't win a Heisman but brought home the National Championship. He left early and won rookie of the year. After that, welp, his psyche unraveled. I like Manziel but he won't win a NC and I doubt that he'd see playing time his rookie year. Sorry, Vince>Johnny. Agreed! Ags can say what they want about the stupid Heisman. The only evidence a Texas fan need present is a tape of the 2006 Rose Bowl. This may at least shed some light on comments by Manziel's dad in the Wright Thompson ESPN story. Dad went after A&M and all the money that "A&M, Kevin Sumlin and the NCAA" have made because of Johnny and poor Johnny Football had made nothing. I still can't figure out who is worse in this saga, Johnny or his parents. a lot of kids go to college to get away from their family. His family followed him. Makes you wonder how different things would be if they would have stayed in Kerrville, or how worse it would be at least. Million dollar arm. 5 cent head. Mystery is that he seems to have a money family. Why the need for extra income? Then again, my decision-making at 20 was questionable at best. A hillbilly is a hillbilly. Even if he wins the Heisman Trophy and lives in Kerrville, Texas. After the inevitable fall, this needs to be on reality TV. I feel compelled to say I think the NCAA rules on them getting all the money and none for the athlete is wrong. But I don't have the solution. Didn't we already go through this amateurism farce with the Olympic Committee some years past? Never going to happen still waiting for more proof than scumbags saying it happened and ESPN that is in bed with Texas. Richie you can keep dreaming for this dream of yours to play out. Going to take it actually happening for a suspension to come down. And as badly as you want this there isn't one shred of evidence. Scumbags that wont even talk to the NCAA aren't going to cut it and ESPN assassins like Rovall aren't going to do anything. This is all shoot first and ask questions latter type news reporting from ESPN. I suppose the video of Manziel signing would not be considered "one shred of evidence"? Not illegal to sign stuff. Jamey..Talk to Dez Bryant..He was suspended for 8 games and saw his name taken off NFL draft boards. His transgression was going to lunch with Deon. Jamey....then why does he tell the broker not to tell anyone about the signing? There's no need to deny involvement in something that's legal, right? Richie you going to report on the 300+ autographs this broker has of Jadeveon Clowney? Pretty big deal as Clowney is probably the first pick in next season's NFL draft. You won't talk about it as you have an agenda. You had an agenda on the radio as well and that was your undoing as your not lickable you come off as a punk driving an agenda.